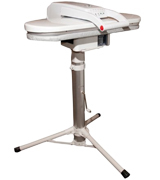 Speedy Press Super Premier comes with a useful press stand that allows you to do the ironing anywhere you wish to. The whole structure is quite bulky. The Super Premier steam press from Speedy Press will help you quickly cope with lots of linen. Great appliance for a large family or for a hostel. The iron plate heats up to the set temperature within only 1-2 minutes that is usually not specific for the models of this size. Besides, there is a special light indicator that will let you know when the plate is heated. The plug storage is somewhat small for a British pug. 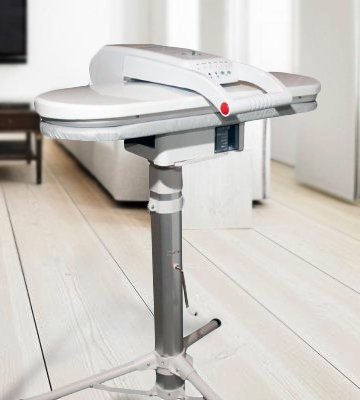 If you are an owner of a small private hotel, a laundry service or simply look for a solution to take the strain off out of a tiresome process of ironing large-size items and linens, this steam press iron from Speedy Press will become your lifesaver. Always delivering professional ironing and pressing results, it will save you a lot of time. The upper plate has 49 steam holes that can release a burst of steam for de-wrinkling even some fairly thick fabric. The safety alarm goes off each time you keep the plate closed for too long. The Singer ESP-2 is certainly an effective fabric steam press that will help you not only de-wrinkle all the fabric you need but also do it effortlessly, thanks to the intuitive menu. Fitted with a non-stick Teflon coating, the ironing plate efficiently reflects heat that allows minimizing the heat loss while maximizing the unit performance. The model needs to be put on a perfectly even surface to avoid sliding. The PSP202-E will be highly appreciated by those users who are limited in space to place a full-scale ironing board. 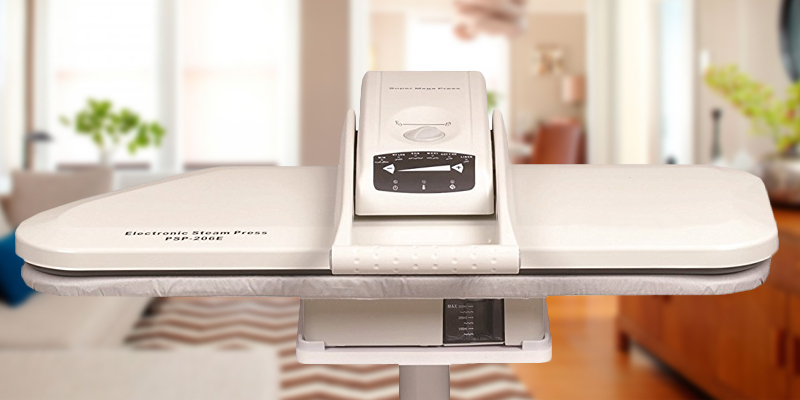 You can conveniently accommodate this compact iron press on the table or side table and iron anything you need. In addition, it compactly folds for space-saving storage. The stand coming in the set is height adjustable from 67 to 78 cm that will let you optimally customize the unit position to perfectly fit your height. Meanwhile, a telescopic mechanism will securely fix the press in the selected position preventing side play. Some users claim uneven steam distribution. 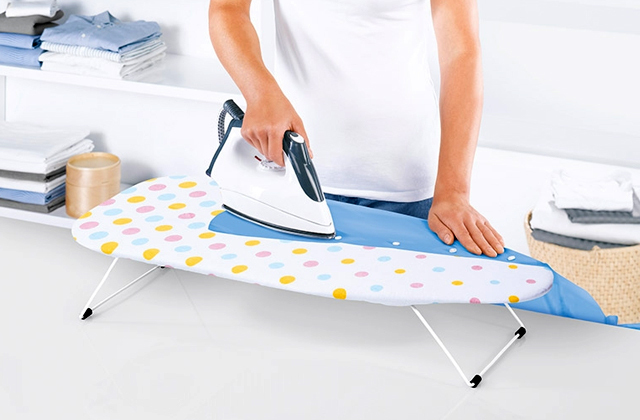 With this model, you will get a fully functional all-in-one unit combining both a handy ironing board and a high-performance iron suitable both for home and commercial-scale ironing tasks. Stable, easy-to-use, efficient, and packed with all the necessary accessories, the unit will serve you for years. A variety of fabric steam presses are available on the market - some of them have an extra-high steam pressure, others are compact but some people need those having a large pressing area. We couldn't make a shortlist and not include these models too. The Speedy Press Super Premier is one of such devices. The model is produced by Speedy Press - one of the most popular manufacturers of steam presses in the world. It has a really large plate - 80 cm long. The advantage is obvious: you can de-wrinkle a larger piece of fabric than in case you'd use a smaller steam press. 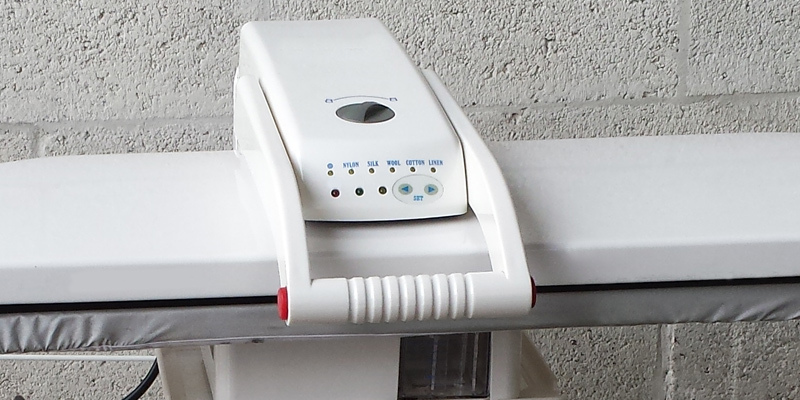 Thus, this Speedy Press is particularly efficient for smoothing linen, such as bath towels or sheets. A larger appliance is usually more difficult-to-use but this clothes steam press requires the same effort as any other similar unit. Let's also say a few words about storage. Since the appliance is only 31 cm wide, it's easy to store and carry. Moreover, this steam press comes with a special stand, so you can place it anywhere you like and do ironing there. 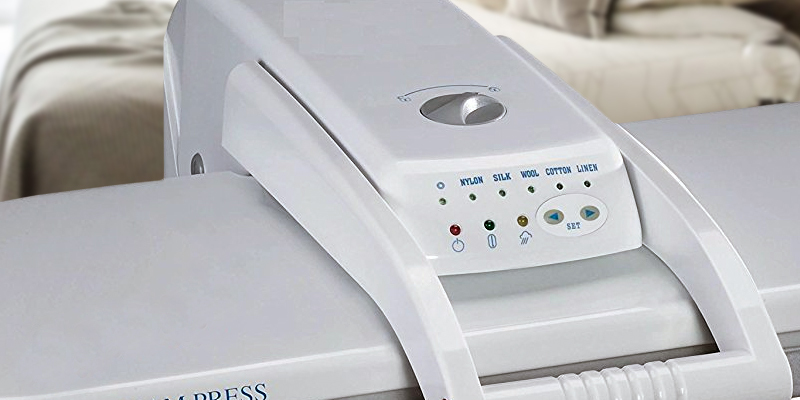 In our opinion, the Speedy Press Super Premier is the best choice for large families as well as for commercial purposes (for de-wrinkling the linen in a hostel or a small hotel, for example). Ironing is a boring process unless you are one of those who regard it as a kind of meditation practice and let all their thoughts go while moving the iron back and forth over the ironing board. And even if you are the “ironing meditator”, it’s hard to disagree that ironing might get really tiresome, especially if you have a whole pile of clothing items and linen to de-wrinkle. This is where the Speedy Press PSP206E will come in handy. Featuring an impressive power of 1600 Watts, the unit will heat up to the selected temperature within 1 or 2 minutes depending on the ironing mode you choose and a special light indicator on the control panel will let you know when the ironing plate is perfectly preheated. A choice of temperature settings will let you adjust the right temperature to achieve perfect ironing results on all types of natural and synthetic fabrics, while a steaming function allows quickly smoothing the deepest folds and wrinkles. 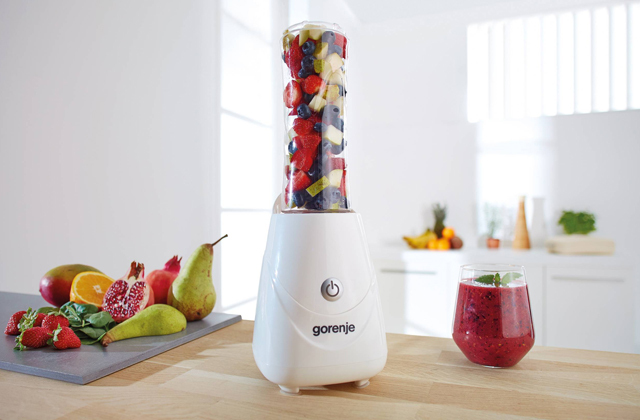 All functions are operated by intuitive electronic controls on the top of the unit. 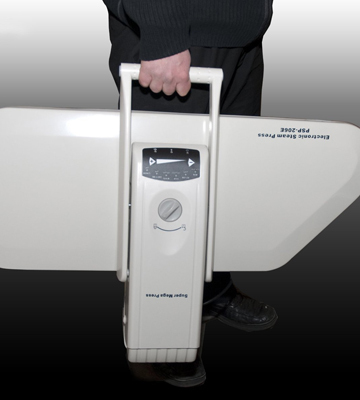 Another benefit of this model that cannot be omitted is a larger size of the plates that are 80 cm long. 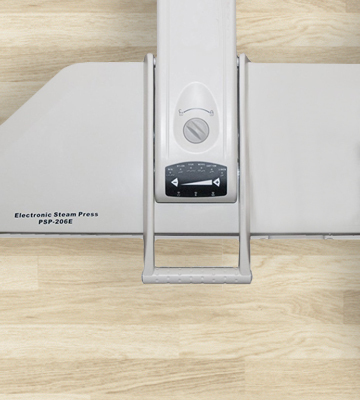 Featuring about 20% longer plates than the majority of other models, this unit will help you iron large items like sheets, bath towels, tablecloths, and light couch coverlets times faster and easier. 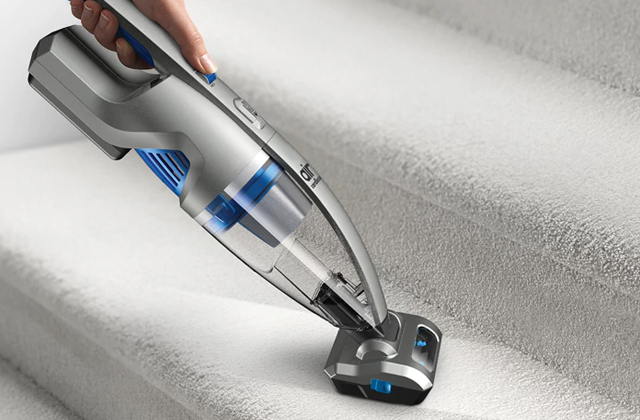 Though the appliance looks pretty bulky as compared with a conventional iron and might seem somewhat difficult to use, in practice, it appears very easy to manipulate and much more efficient than its smaller traditional competitor. You will quickly get the hang of it and will hardly want to come back to your old iron. When not in use, the plates can be locked in place and the unit can be stowed away in a closet or even somewhere behind the furniture. 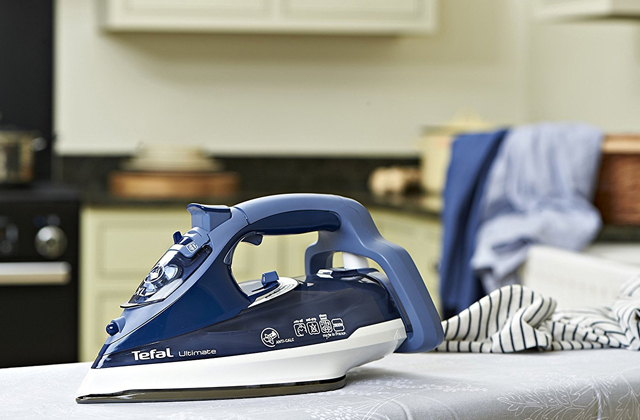 Would you like to do the ironing twice as fast as you'd do it with a conventional iron? It's easy if you have the Singer steam press! The pressing area of this appliance is far superior to that of any iron, so the Singer ESP-2 can quickly de-wrinkle multiple clothes. The fabric steam press is powerful and efficient - the force of pressure between two plates equals 50 kg, so the appliance can smooth even some fairly thick fabric. 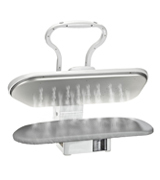 Moreover, the upper plate has 49 holes through which the steam is released. 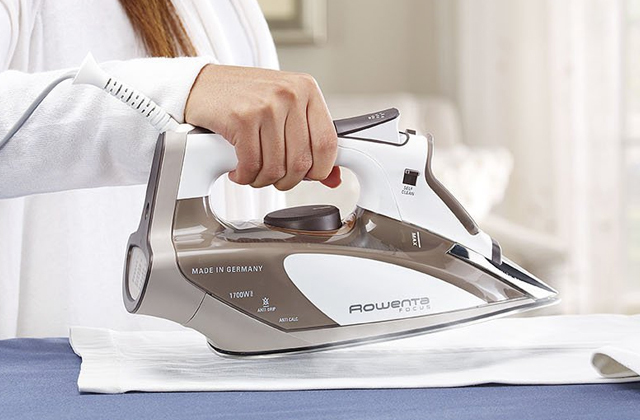 It improves the quality and efficiency of ironing and allows you to use a burst of steam. Yet, we recommend you to follow the maintenance guide and use distilled water only; otherwise, the holes will get clogged over time and the steam press will leave stains on your clothes. Just like the best steam presses, the Singer ESP-2 offers several temperature settings for various types of fabric, namely such as nylon, silk, wool, cotton, and linen. Of course, the appliance has an effective safety system - if you keep the upper plate closed for more than 10 seconds, the alarm will start to beep, so there's no risk of fire. And if you ever happen to leave this tabletop steam press plugged in, it will shut off automatically in 15 minutes. 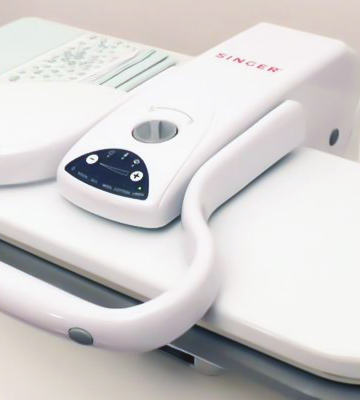 Without any doubt, the Singer steam press is extremely efficient not only because it allows you to do ironing quickly but also because it doesn't consume a lot of energy. Steam presses are times bigger and heavier than ordinary irons. Yet, such design is exactly what makes them so much more efficient and versatile than those smaller irons we got used to. Many people think an iron press is rather an appliance for commercial use or large houses and those who live in relatively small city apartments or are somehow limited in space can’t afford one. The PSP202E steam press from Speedy Press will prove you the opposite. The model comes without a stand and its relatively small base with a built-in reservoir for generating steam does not take a large area. Hence, you can easily find the place for this ironing assistant on any table or countertop in the kitchen, living room or laundry room, if you have one. The plates size of 64x27 cm is smaller than that of many other models that will let you conveniently use and store the unit even in a small flat or downtown studio. Meanwhile, this size is enough for ironing and steaming large items quicker and easier than you’ve done ever before. When not in use, the model locks for compact, safe, and convenient storage. Despite its pretty compact design, the unit performance is in no way inferior to that of bigger models. 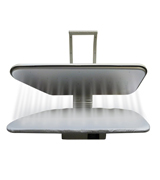 A 1400-watt heating element heats the ironing plate or turns water into fine steam in mere minutes. 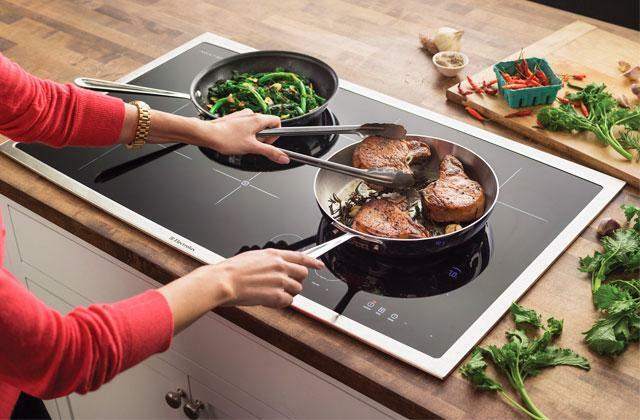 The non-stick Teflon coating on the plate not only prevents any fabric sticking or burning but also reflects heat more efficiently that allows minimizing the heat loss and maximizing the unit performance. Fitted with several temperature settings, the appliance works great on fabrics of different thickness and texture. Be it a thicker and more durable cotton or fine and delicate silk, this steam press iron will deliver ideal ironing results. 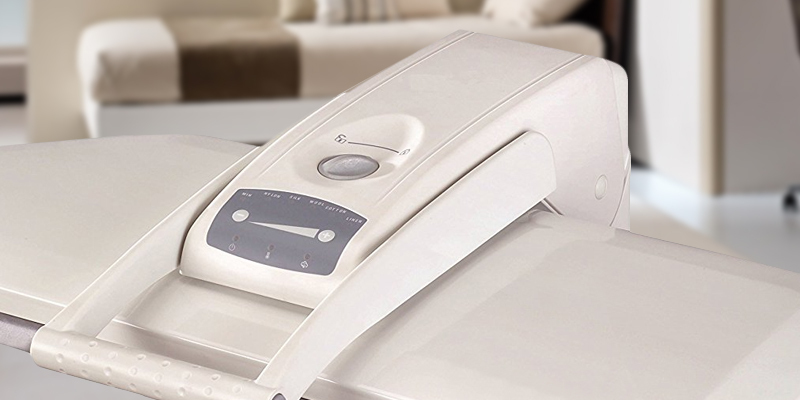 With the PSP202E, you can enjoy all the benefits of steam press irons, no matter how small or large your dwelling is. For most of us, common ironing tools are an iron and an ironing board. Some don’t have an ironing board and often use an ordinary table to iron clothes. However, an ironing board is not a mere board with supportive legs. It is specifically designed and shaped to conveniently iron all types of garments, be it pants and skirts or dresses and shirts, and smooth wrinkles on most tricky parts of clothing including sleeves, collars, pant legs, pocket areas, and belts. That’s not to say about the convenience of ironing large linen and bedding items. Those, who tried to iron on an ordinary table at least once, know firsthand what it is like. 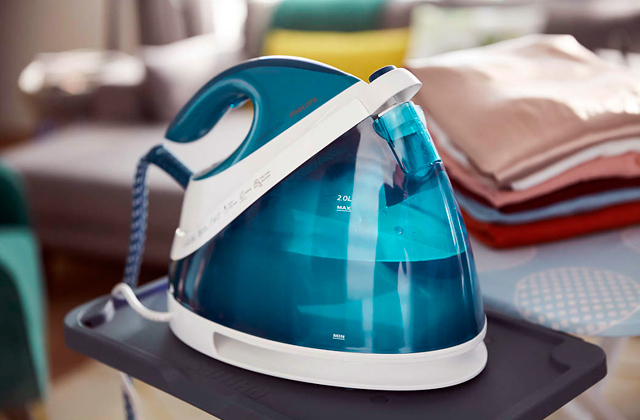 Wouldn’t it be nice to have an appliance combining all the benefits of a top-quality iron and the convenience of an ironing board? This is what you will get with the PSP202E+ steam iron press. 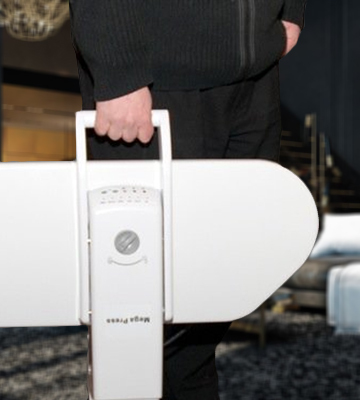 When fully assembled, this model looks pretty much like an ironing board. In fact, it’s a steam press coming complete with a stand. The stand is height adjustable from 67 to 78 cm that will let you optimally customize the unit position to perfectly fit your height. A tripod construction of the stand is extremely stable and supportive keeping the whole assembly securely in place and eliminating any risk of tipping. Meanwhile, a telescopic mechanism will securely fix the press in the selected position to prevent side play and displacement. 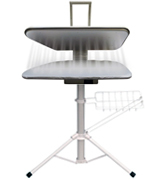 The stand is detachable that greatly contributes to the versatility of the unit and allows you to use the steam press mounted on the stand when ironing linen or large clothing items or placed on the table for some minor ironing tasks. Speaking of the iron press, it offers all the features you’d expect from a quality unit of this type. Several adjustable temperature settings allow using the press for steaming and ironing thick and thin, natural and synthetic fabrics including nylon, silk, cotton, and wool. A 1400-watt heating element will quickly heat up the ironing plate up to the set temperature and a green light signal will let you know that the selected temperature is achieved. A non-stick plate will protect delicate fabrics from any possible damages and a streaming option will help make even heavily wrinkled thick fabrics perfectly smooth. With this model, you will get a fully functional all-in-one unit suitable both for home and for commercial-scale ironing tasks. 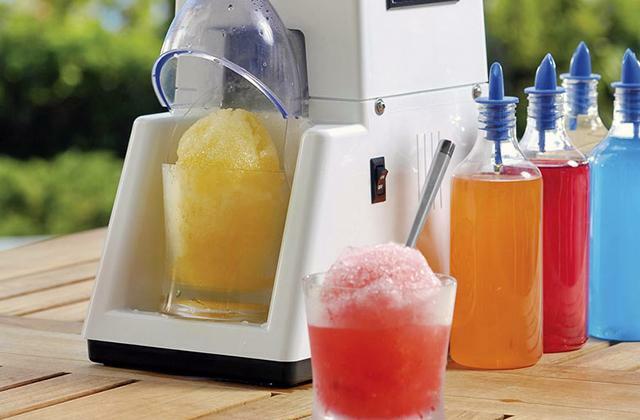 Stable, easy-to-use, efficient, and packed with all the necessary accessories, the unit will serve you for years. What Is a Steam Press? Our clothes need care and that's why ironing is essential. If you have plenty of chores, consider getting a time-saving alternative to a conventional iron. 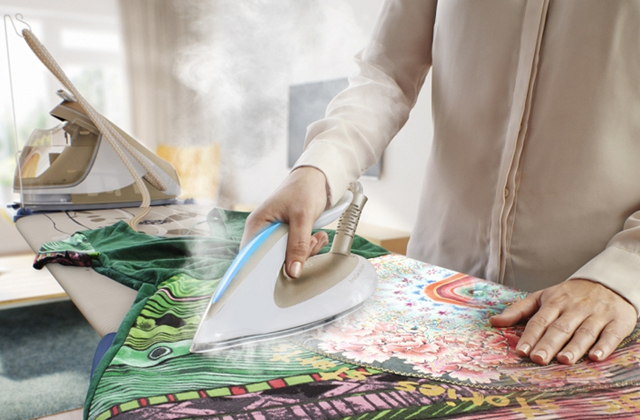 How about a clothes steam press - the most powerful ironing appliance? 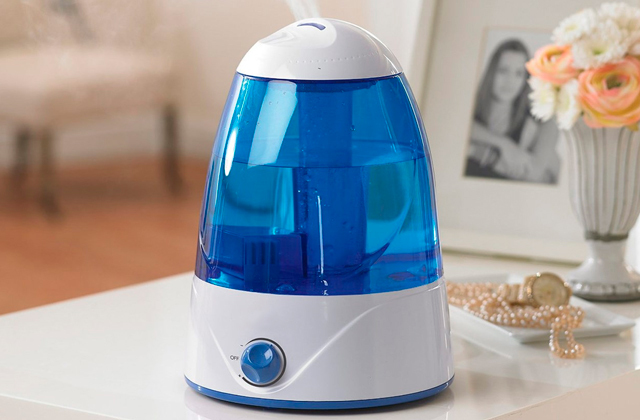 It was designed for steaming all kinds of fabric effortlessly. Its operation principle is simple and effective: the garment is pressed between two heated plates and then steamed. It smooths the wrinkles in no time and kills dangerous bacteria. Not so long ago, you could see steam presses only at dry cleaning services or tailor workshops. 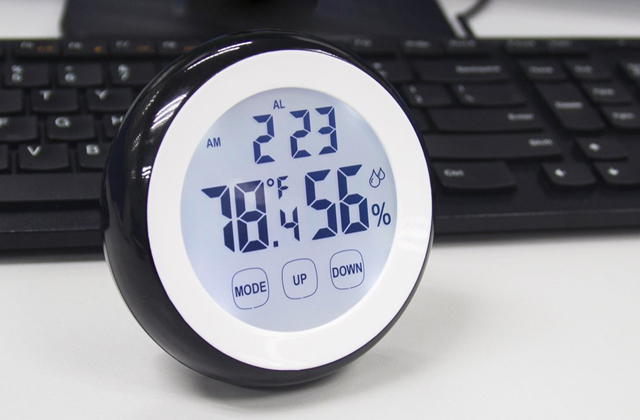 Today, there is a huge variety of models designed for home use. A clothes steam press is an amazingly comfortable appliance that requires no particular skills for effective usage. With an ironing surface up to 10 times larger than that of a conventional iron, you will press lots of clothes in no time! 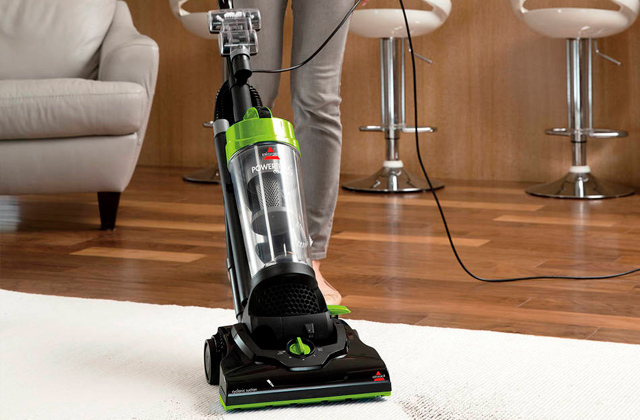 To keep your house clean and tidy, consider getting a steam cleaner that will help kill bacteria and germs. If you wish to do all the ironing quickly and effectively, we recommend considering one of the best garment steamers from our review. 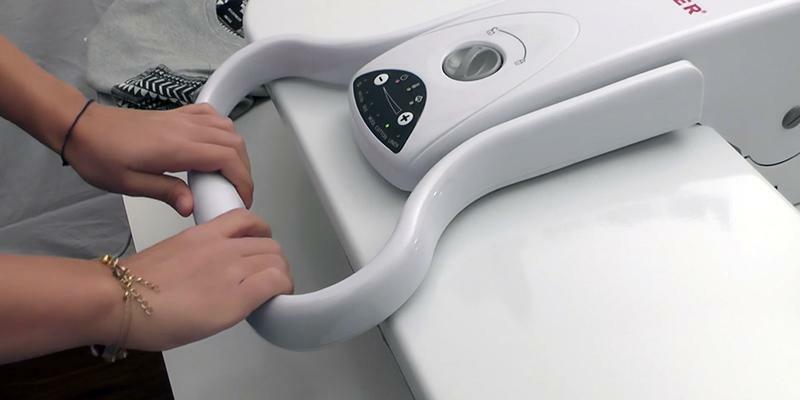 These appliances do the ironing by creating a powerful and hot steam that de-wrinkles clothing and linen in no time. There are some issues to consider before choosing a steam press. The first one is the size of an appliance. If you need to de-wrinkle large clothes or linen, it is recommended to get a device with a bigger ironing surface. This way, you can steam a larger area per each pressing, which means you won't have to spend hours on ironing. 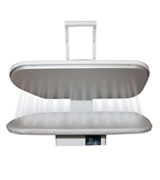 On the other hand, if you don't have enough space to store a clothes steam press in your house or apartment, you should choose a portable and lightweight model. The next major point is the power of a steam press since it affects the efficiency. Thanks to the powerful heating element, a steam press pre-heats in no time so the steaming becomes more effective. As a result, it is easy to remove wrinkles, crease your pants, or even de-wrinkle really thick fabric that will save you plenty of time! Finally, you should consider all the extra features each clothes steam press has. Most of such appliances can both smooth the fabric and apply steam. A large water tank allows steaming garments without refilling it too often. Multiple steam jets will efficiently remove wrinkles. Ergonomic controls will help you adjust the temperature for each type of fabric while a digital display will let you see the current setting. A non-stick coating will prevent sticking of fabric to the hot surface of a steam press. Thus, you won't burn or damage your clothes, sheets, towels, and linen. Check if a clothes steam press has an auto shut-off function that ensures safety in case you forget that the appliance on. We have reviewed 5 best clothes steam presses available on the market to make your choice easier. Now, it is time to pick the appliance that will make the ironing a breeze and give you more free time! 1. Laura Dixon How to Use a Steam Press, eHow. 2. Mariette Mifflin Garment Steam Press - Definition and Best Uses, About. 3. How Does an Ironing Press Work? DoItYouself.co. 4. How to Steam Press a Sweater or Other Knit Garment, wikiHow.